JOOP! Homme cologne by JOOP comes in a vertically rectangular thick glass cut bottle. It is transparent and has a pink liquid inside. In a first sight of bottle, it gives an impression of to be for women by color, but in actual this cologne is for men only. 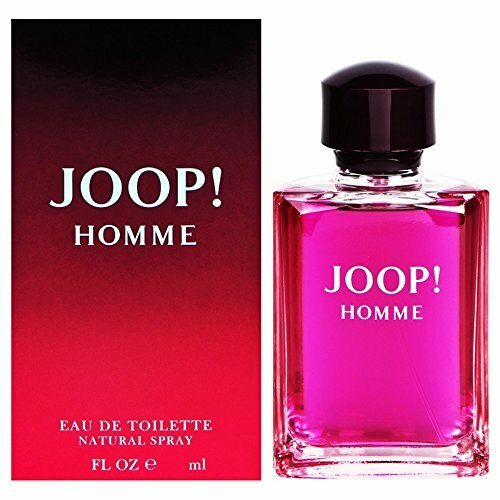 At the top “HOMME” is written in simple white font and towards the center “JOOP” is written in much larger font. At the bottom of the bottle “EAU DE TOILETTE” is printed in small font. The cap is black, plastic and screws on. This fragrance was created in 1989 and is categorized as a fresh citrusy fruit smell. This cologne has notes of heliotrope, orange blossom, lemon, mandarin, bergamot, floral heart, jasmine and lilies-of-the-valley. It also contains hints of cinnamon, woods, vanilla, tonka bean, patchouli and sandalwood. This scent is exotic and exciting giving off sweet scents and mixing a variety of fruit and flowers together. Although this bottle of cologne may look semi feminine with the pink coloring, it is everything but. JOOP! Homme radiates masculinity and is recommended for a mature man. Joop Homme has a moderate scent strength which means it does not require a lot of sprays to achieve maximum results. It does not need constant reapplication as the scent life lasts from six to ten hours and is best worn in a casual setting. This cologne is available in a 1 oz bottle which retails for $30.00, a 2.5 oz bottle which retails for $50.00 and a 4.2 oz bottle which retails for 65.00. This is a fun sweet scented fragrance that is great for an adventurous fun loving modern man. It is available at select stores and is great as a gift. © 2019 MuaBan Perfume. All rights reserved.